The MightyLam 2700HC laminator is high on productivity and low on cost, this ultimate production solution and profit center is great for commercial print shops, copy and service centers, sign shops, in-house graphic departments, and so much more! The newly-redesigned MightyLam 2700HC Laminating/Mounting machine can be used as a laminator in a quick print environment or as a laminating/mounting for images up to 24” wide. The MightyLam 2700HC has the ability to laminate 0-10’ per/minute or 3m/min. This machine has the ability to laminate both hot and cold with dual heated rollers, and release liner take up. The MightyLam 2700HC is safe for everyone to use with a clear polycarbonate safety shield. This affordable and functional laminator is capable of running all types of cold and heat-set pressure sensitive laminates and adhesives, and encapsulating with true thermal laminates. The MightyLam 2700HC features a ”heat assist” mode (top roller heat only) that delivers the perfect heat level to increase initial adhesion and clarity of slow curing pressure sensitive films, lessening the time to receive finished output suitable for display. The easy to set LCD heat controls with readouts, and Teflon coated heat shoes offers quick warm up time. The variable speed controls in this machine allows you to laminate documents from 1.5 to 10 mil with ease. The MightLam 2700HC also features adjustable slitters for side trimming on production runs and the drop down bottom idler allows for easy loading. The reverse mode provides an easy misfeed correction to help you get your desired results every time. Now you can experience incomparable laminating quality and value with the plug-and-play MightyLam 2700HC Laminating/Mounting machine! If you have any questions or are interested in the MightyLam 2700HC, visit us at SpiralBinding.com. 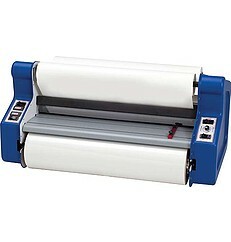 We have great pricing on a full line of Variable Speed Laminating Machines. Call us at 1-800-631-3572 for more information!